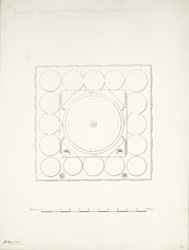 Illustration showing the arrangements of the domes on the roof of the tomb of Darya Khan, located near the Delhi Gate at Ahmadabad in Gujarat from James Burgess' 'Original Drawings [of] Muhammadan Architecture of Ahmadabad.' Darya Khan's tomb, built in 1453 during the reign of Sultan Qutb-ud-Din Ahmad II (r. 1451-58), is composed of brick in an imperfect square plan with dimensions of 121 x 119 feet. The interior space consists of a central room with the principle tomb, and is surrounded by a corridor on all four sides. The central area is covered with one of the largest central domes that extends to 17 feet from its base. Sixteen smaller domes surround the central dome. The principle tomb enclosed with a masonry canopy which is supported by 12 pillars. In the front of the building, there are two staircases which lead to balconies that overlook the central hall.